Have fun with botany! Understanding how plants grow and develop, how water and nutrients are taken up and distributed, and how leaves, flowers, stems, and roots function are key to becoming a successful gardener. Discover intriguing relationships between plants and pollinators, how seeds and fruits form, and why plants grow toward the sun. 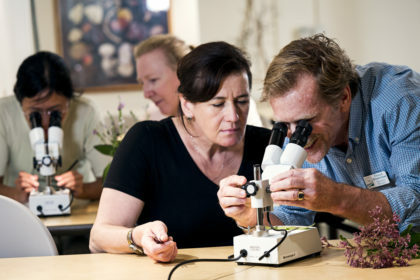 Develop basic plant identification skills and learn the reasons for using scientific names. You will be amazed at what goes on unnoticed in the plants that live all around us. Please review the Required & Recommended Texts before the first class. This class qualifies for the following professional credits: 8 APLD, 4 CNP credits with DNLA, ISA, 4 NOFA AOLCP, and PLNA. Eight professional development hours (PDH) have been approved for this class through LA CES. This class meets LA CES standards for HSW subject matter.